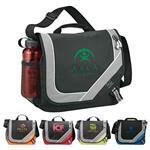 The Elation Messenger Bag - affordable and full of features! 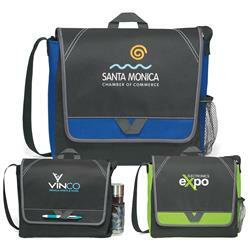 Great for conferences and tradeshows as well as everyday use. 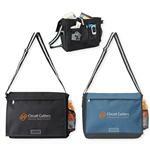 Stylish messenger bag for the busy professional or student. Shoulder strap and top grab handle. Side mesh pocket for water bottle (water bottle not included). Front pen loop (pen not included). Pocket under front flap ideal for storing smart phone or business cards. Stylish contrast stitching. ID window on back. Back panel of each bag is black.. FREE 1-DAY RUSH PRODUCTION AVAILABLE! Available Imprint Options: Print, Embroidery or Full Color Imprint.